Ever wonder where you can go to get a good "high-up" view of Chicago? Come with us as we gain special access to hidden heights and unique depths in the heart of the city. Tours cover about 1.5 miles at a leisurely pace on foot, and last about 2 hours. We get asked ALL THE TIME, "Where do we go to get a good high-up view of the city?" You could purchase expensive tickets to go wait in a long line at some tourist-treadmill observatory that everyone else knows about (and will be at). Or, you can join Inside Chicago Walking Tours on a brand-new, high-up and low-down exploration of some personally curated favorite spots that give you tons of great, unique views, all for one low ticket price! No lines, no impersonal service, no cookie-cutter photos to bring back home. Come join Inside Chicago Walking Tours on a unique, exciting urban adventure! Company founder and head tour guide, Hillary, is incredibly excited to introduce this brand new tour route that she's been wanting to launch since she started her business in 2014. Having formed friendly relationships with building staff and management in many spots downtown, as well as a solid reputation for quality tours and very satisfied customers, she is now able to welcome guests to special access granted by a handful of buildings to secret, amazing views of the city! On this special new tour route, Inside Chicago Walking Tours will show you not only the stunning secret views from high up, but also the fascinating and fun views from down low. 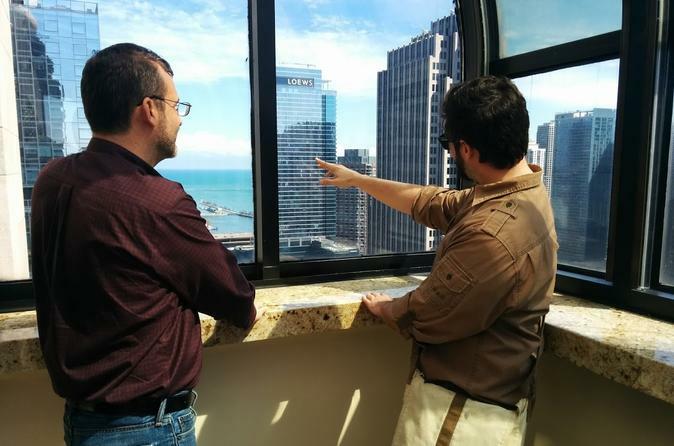 This tour is all about exploring the levels of downtown Chicago, from more than 30 floors up, to ground level — and beyond!